This website provides details about photographers who came to Maitland, New South Wales. Some of them were here for days, while others stayed permanently. The project began with a few old photographs where the name of the subject was unknown, but the identity that could be discovered was that of the photographer, with studios and photographers names recorded on the photograph's mount. The name of the person being photographed has been included where identification is possible, however knowing the name is not necessarilyimportant - their expression, clothing and the studio setting allow you to decide who that person may be at that particular moment. The dates of this website primarily cover the period 1845 to around 1900, although some photographers flow further into the 20th century and demarcations are often indistinct. Dates of photographers' activities in Maitland have been substantially sourced from the Maitland Mercury newspaper and hence reflect dates of advertising and articles. Most of these photographs are not in pristine condition - imperfect storage environments for one hundred years can takes its toll. The photographs have led a variety of lives under a variety of circumstances and each tells its own tale of endurance. The primary focus of this website is the photographers' time in Maitland, rather than their achievements elsewhere. The size of individual photographs has not been noted, but broadly, photographs up to 1880 are likely to be Carte-de-Visite (CDV) measuring 6.3 x 10.5 cm. 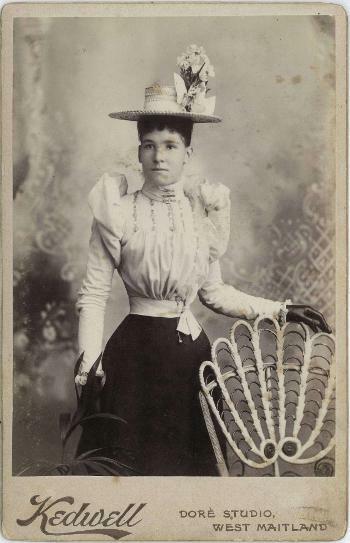 After 1880 the larger Cabinet Card measuring 11.5 x 16.5 cm was introduced, but there are many variations. Please enjoy the photographs published here and the details of the photographers who captured these images.